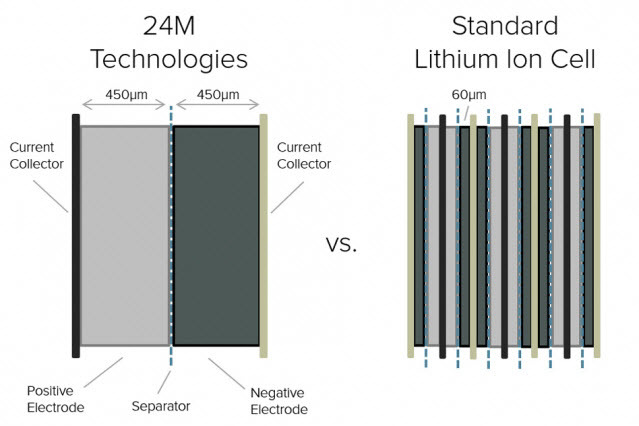 Researchers at MIT and spinoff company 24M have developed an advanced manufacturing approach for rechargeable lithium-ion batteries. The researchers claim the new process could cut the manufacturing and materials cost in half compared to existing lithium-ion batteries, while also improving their performance, making them easier to recycle as well as flexible and resistant to damage. By 2020, Chiang estimates, 24M will be able to produce batteries for less than $100 per kilowatt-hour of capacity — considered the threshold for mass adoption of electric vehicles, according to most analysts within the EV industry, Clean Technica notes, adding that the planned Tesla Gigafactory 1 also hopes to hit that figure by 2017. The new process is a hybrid between a conventional solid battery and a “flow battery” design, in which the electrodes are actually suspensions of tiny particles carried by a liquid and pumped through various compartments of the battery. The flow battery was developed five years ago by Chiang and colleagues including W. Craig Carter, the MIT POSCO Professor of Materials Science and Engineering. 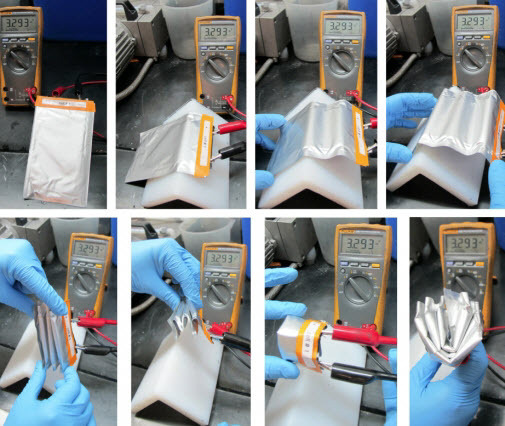 This approach greatly simplifies manufacturing, and also makes batteries that are flexible and resistant to damage, says Chiang, who is senior author of a paper on the new battery design in the Journal of Power Sources. This analysis demonstrates that while a flow-battery system is appropriate for battery chemistries with a low energy density (those that can only store a limited amount of energy for a given weight), for high-energy-density devices such as lithium-ion batteries, the extra complexity and components of a flow system would add unnecessary extra cost. The new design also produces a battery that is more flexible and resilient. Conventional lithium-ion batteries are composed of brittle electrodes that can crack under stress; the new design produces battery cells that can be bent, folded, or even penetrated by bullets without failing. This should improve both safety and durability, he says. The company has so far made about 10,000 batteries on its prototype assembly lines for testing. The process has received eight patents and has 75 additional patents under review; 24M has raised $50 million in financing from venture capital firms and a U.S. Department of Energy grant. Another advantage of this approach, Chiang says, is that factories using the method can be scaled up by simply adding identical units. With traditional lithium-ion production, plants must be built at large scale from the beginning in order to keep down unit costs, so they require much larger initial capital expenditures. A University of Illinois at Urbana-Champaign researcher was also involved in the study. The work was supported by the U.S. Department of Energy’s Center for Energy Storage Research, based at Argonne National Laboratory in Illinois. Flow batteries are a promising grid-storage technology that is scalable, inherently flexible in power/energy ratio, and potentially low cost in comparison to conventional or “static” battery architectures. Recent advances in flow chemistries are enabling significantly higher energy density flow electrodes. When the same battery chemistry can arguably be used in either a flow or static electrode design, the relative merits of either design choice become of interest. Here, we analyze the costs of the electrochemically active stack for both architectures under the constraint of constant energy efficiency and charge and discharge rates, using as case studies the aqueous vanadium-redox chemistry, widely used in conventional flow batteries, and aqueous lithium-iron-phosphate (LFP)/lithium-titanium-phosphate (LTP) suspensions, an example of a higher energy density suspension-based electrode. It is found that although flow batteries always have a cost advantage ($ kWh−1) at the stack level modeled, the advantage is a strong function of flow electrode energy density. For the LFP/LTP case, the cost advantages decreases from ∼50% to ∼10% over experimentally reasonable ranges of suspension loading. Such results are important input for design choices when both battery architectures are viable options.